Through millennia, Colombia’s social and political development has been shaped by its vast and varied geography. With mountains, jungles and thousands of kilometres of shoreline, natural barriers lead to more independent regional development. These dramatic landscapes have even shaped their athletes—if you follow professional cycling you probably know that Colombia, for a time, was synonymous with elite competitive cycling, particularly in its mountain regions. And for good reason. Colombians born and raised in the mountains have not only developed high-altitude physiology, but to get anywhere have to haul themselves up and over some sizeable passes. There is no mistaking the highlands of Colombia with the flats of Holland! In the 1980s, Colombians built their reputation as international powerhouses with cyclists like Luis Herrera and Fabio Parra riding high on the European circuit. Time passed, and the sheen wore off. But not for long. A new crop of top-drawer racers has made its way onto some of the best European teams. In 2013, Nairo Quintana placed second in the Tour de France, then went on to win the 2014 edition of the Giro d’Italia. And he isn’t alone, with other Colombians like Rigoberto Urán, Julian Arredondo and Esteban Chaves showing their chops. But cycling in Colombia isn’t reserved only for elite athletes. As Team Outpost drove around the highlands north of Bogotá, we saw dozens of amateurs winding and grinding their way up over some brutal looking mountain passes. Not surprisingly, the country also has plenty of phenomenal mountain-biking opportunities. The hills and canyons around San Gil, five hours north of Bogotá, is one locale to spin your legs, test your lungs, and just get dirty. The area surrounding Medellín also has some great single track. If you need more proof that cycling has gone mainstream in Colombia, look no further than the many car-free streets in Bogotá every Sunday (and holiday) from 7 a.m. to 2 p.m. “Ciclovía,” as it’s known, began in the capital city way back in 1976, and spread to other urban centres, like Cali and Medellín. Not so long ago, some politicians who opposed closing the streets to vehicular traffic tried to stop the event by declaring that it created traffic jams; but a public uprising ensured their efforts to end the weekly cycle-way were driven off track (pun intended). 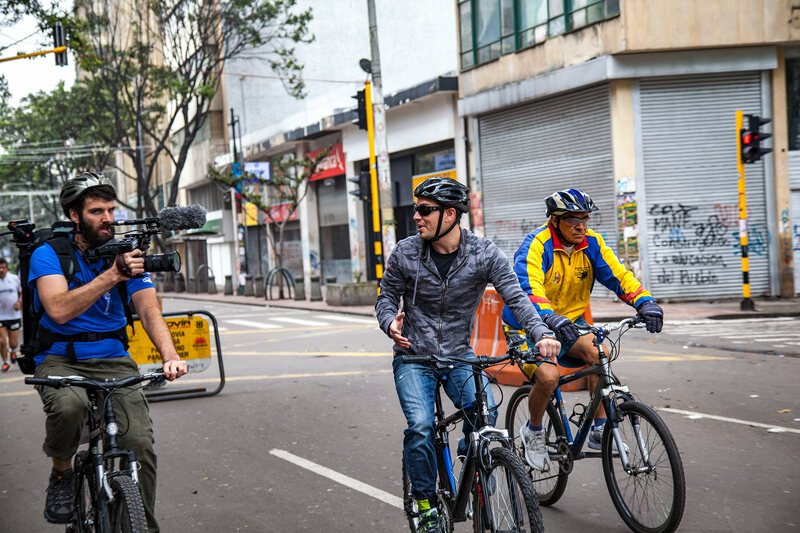 We got the chance to cruise Bogotá one Sunday morning, renting bikes and rubbing metaphorical shoulders with other cyclists, as well as joggers, walkers and skateboarders. Getting around by bike is liberating and allowed us to cover more ground, see more neighbourhoods and feel like we were part of something big—on average, an astounding two million people come out each week to enjoy the ciclovía! Build it and they will come, as they often say. That’s what Bogotá learned when they developed a vast network of dedicated bike lanes throughout the city. An estimated 300,000 to 400,000 trips are now made by bike every single day. No doubt, Colombia’s love affair with the bike is only going to grow—one “cycle” I hope the country will never grow out of.